It's been a low-key day here at the Watson household. No marathons here. We did take our morning walk with the dogs down to meditation rock. Meditation rock (My name for it) is about 300 yards behind the barn and overlooks a small stream. Even when the summer sun in brutal, the farm is like a steam room, and there's no rain in sight, the little stream has a trickle of water bubbling on its destination southward. 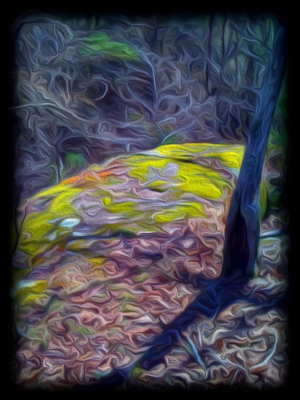 You can be wound as tight as a tenor banjo string, and ready to turn the big nasty loose on anyone if they look at you wrong.....then a few moments sitting on meditation rock listening to the gurgle of water over smooth stones, and your mind untangles. The turds will live another day, thanks to this little piece of heaven. I usually feel taller after sitting there a while looking at the sky, and inhaling mother nature's perfume. I've bitten off a great deal to chew lately. Jilda and I are playing a lot, I'm marketing a book, taking the Master Gardener's class, and also an online songwriting class from Coursera.org. Today as we stood for a moment on meditation rock, I thought to myself, "I need to spend some quality time here to clean my mental house." I hope you all have had a good weekend. Tomorrow is St. Patrick's Day. May you all be blessed with the Luck of the Irish. Your rock sounds like a place I have up in the woods here. Everyone should have a special spot to contemplate life! I hope your weekend is good. It's great to be busy and you and Jilda do so much and don't let things slow you down. I'm hoping even this Greek gal can grab some of that Irish luck....I already have plenty of "blarney"! Beautiful post and beautiful painting. Lovely post, and now that's you've identified the problem- cleaning your mental house shouldn't be much of a problem I am sure. Good luck and Happy st Pats! Thanks Rick. And I send you and Jilda some St Patties' blessings as well. Meditation rock is a nice place to visit. I used to have a similar place I liked going to. It Zens you into a peaceful frame of mind.